Warts are small and very infectious skin developments or growths that appear on different body parts like hands, fingers, knees, toes or feet. The main causes of this infectious out growths is human papilloma virus (HPV). When warts appear these may either in group form associated with damaged skin, cracks or cuts allowing the entry point for virus. What is the best treatment to remove warts? Warts are of several types, among these common warts and plantar warts are most common forms. Common wart (Verruca vulgaris): Common warts are usually dense, black, bumps with lumpy or spotted surfaces that usually appear on the hands, elbows, and knees. Flat warts: These are flatter and smoother than common warts, usually occur on the faces of women and widely spread by shaving. Plantar warts: These warts appear on the bottom of feet and are usually thick and rough, easily mistaken for a callous or corn. Plantar warts grow into the layers of skin and spread out rapidly to the wide area of skin. Genital warts: These warts grow on the skin on and around the genital area and their size and color varies widely. In many case, warts are removed or disappeared on their own within 6 to 24 months and no treatment is needed. However, it is better to treat them because in many cases warts do cause serious pain. Warts are contagious and infectious and keep on spreading to the other parts of the body or to other people also. So proper treatment of warts is necessary. You can treat the wart yourself with a number of over-the-counter (OTC) products at the pharmacy. Treat your warts with salicylic acid: Salicylic acid acts as an irritant to warts and eats away at the build-up of the wart. A paste which is made from crushed Vitamin C tablet mixed with water or an aspirin tablet paste made with water is placed in a pad are possible treatments. To avoid skin reaction or rash, apply this paste only to warts. Cover warts with a few layers of adhesive tape: apply the Salicylic acid paste on the moisten warts and keep them covered with few layers of adhesive tape from six to minimum one month time period. Taping can enhance the removal of dead skin from the wart. Duct tape, scotch tape, masking tape are all viable choices. Soak warts in hot water to soften the skin: With this technique, Papilloma virus got killed using hot water, as hot as one can bear without burning of the skin. Soak warts in this hot water, warts become soften and finally worn down by filling of emery board. Remember to be gentle with technique because this may cause irritation and bleeding too. Keep warts covered, clean, and as dry: this technique of treatment limits the spread of papillomavirus and also get rid of warts easily and faster way. Wash warts with hot soapy water and dry it thoroughly. Then cover warts with a dry band-aid or adhesive tape. Keep changing socks and band aid to avoid sweat build-up on plantar warts. Consider FDA-approved OTC: There are several OTC warts removing treatments having varying amounts of salicylic acid, ranging from 17 to 60 percent salicylic acid to remove warts. Avoid to stronger treatment for children. Bandages are the unique and one of the most effective therapeutic techniques after injection. They are applied topically on the skin and medication either becomes available in bloodstream through absorbing from skin layers or act directly on the infected site. In tropical medication drug has better bioavailability as compared to tablet or capsule because in tropical way drug don’t face the first pass effect and becomes directly available in the bloodstream due to this smaller amount of dose is use in bandages causing a lesser side effect. What are bandages for warts? Bandages for warts are actually the band-aids that contain salicylic acid as an active ingredient. These bandages help the salicylic acid to remain intact with wart for a longer period of time so that have good outcomes. In many cases, the whole bandage is not treated with medicine just a small area which is clearly visible to the person. As you place the medicated part of band-aid directly on the wart it quickly start working. Salicylic acid is one of the most widely and frequently using medicine to treat skin conditions like scaling or overgrowth of skin (warts) because salicylic acid as an irritant for warts while salicylic acid also has antioxidant property. These bandages are pre-treated with salicylic acid and usually used as OTC wart remover. 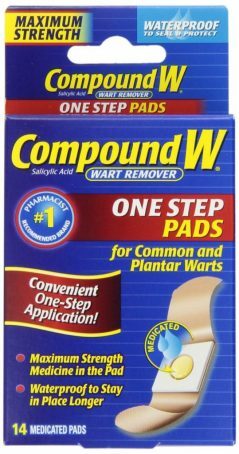 How should bandages for warts be used? 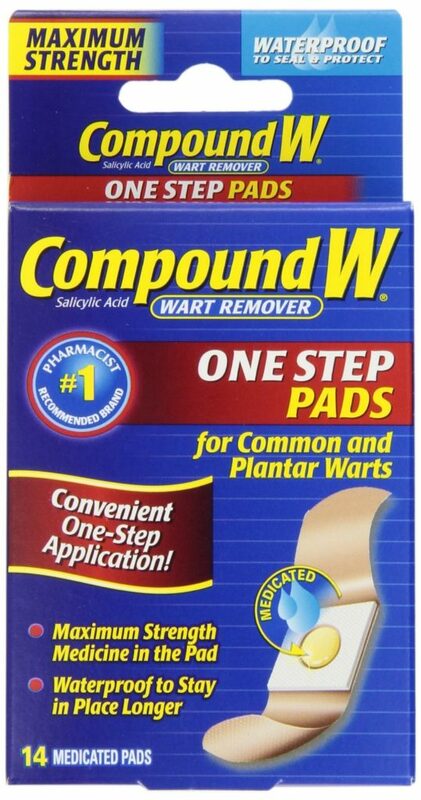 A number of people who are suffering from common or plant warts experience the convenience of wart bandages. When someone is looking for easy to use option than wart bandages are. Salicylic acid in a bandage or in patch form is applied to the skin. These bandages come in several strengths the recommended dosage for common warts or plant warts for an adult is once a day or once every other day. The pre-soaked medicated part of bandage that is applied to the top of a wart. The salicylic acid starts eating and dissolving the wart and eventually removes it completely. A continuous amount of dose is supplied and thus is more effective than lotions or creams. The bandage is made of waterproof and sheer resistant material that why a person can do his daily activities without hindrance. As band-aids provide not only continues the supply of medication but also warm feeling and also keep them dry. This results in quick and easier removal of warts. These warts bandages also have to cushion material and thus protect the skin and build a buffer and cushion toward warts during treatment. Usually, size of bandage which is treated with Salicylic acid is smaller than the size of wart so the whole wart not becomes intact medicated bandage. Or if the size of wart small than skin which is not infected become in contact with Salicylic acid. Due to adhesive material, while removing bandage itching and skin rash may cause. And if the bandage is on the hairy part of the body than removal becomes painful. But the removal of wart is much more important so such little pain is bearable. Bandage must have good adhesive property so that it stick to the skin around the wart without disrupting it. Easy to use. Can be kept on applied so effectively that they can be wear during daily activities, even during taking bath. Some brands have only medicated pads, they do not have bandage part. Such pads are much safe to use. As you don’t want that bandage could damage the nearby skin of wart. Do not use if you allergic to salicylic acid or any other ingredient. Do not use on moles, birthmarks, warts with hairs growing from them, genital warts, warts on face or mucous membrane. ( such bandages are not OTC products these are used only after doctors consult). Wash the infected area with warm water and assure the skin is completely dry. Remove protective covering from the bandage and apply it on the infected part. You can soak or soften the wart by using warm water for 5minutes. It helps the easy removal of a wart.